We had a huge 172 entries for our last challenge at The Card Concept! We’re thrilled that so many crafty people want to play along with our challenge. This fortnight we have a colour challenge for you. I have a story about this card. This is my second card for the challenge as when I first looked at the inspiration picture I had it in my head that the colours were black, green & white. It was only when I went to load my original card to our gallery did I realise the colours were supposed to be espresso, green & white. Note to self – take more notice of the challenge pic BEFORE I make my card! Not entirely sure how I feel about this card, but it was all I could come up with at the last minute. I’ve stamped Stampin’ Up!s Dictionary in the background, but it doesn’t really show up really well in the photo. The two-toned flowers I’ve stamped are from Stampin’ Up!s Simple Stems and the leaves are my favourite from Summer Silhouettes. 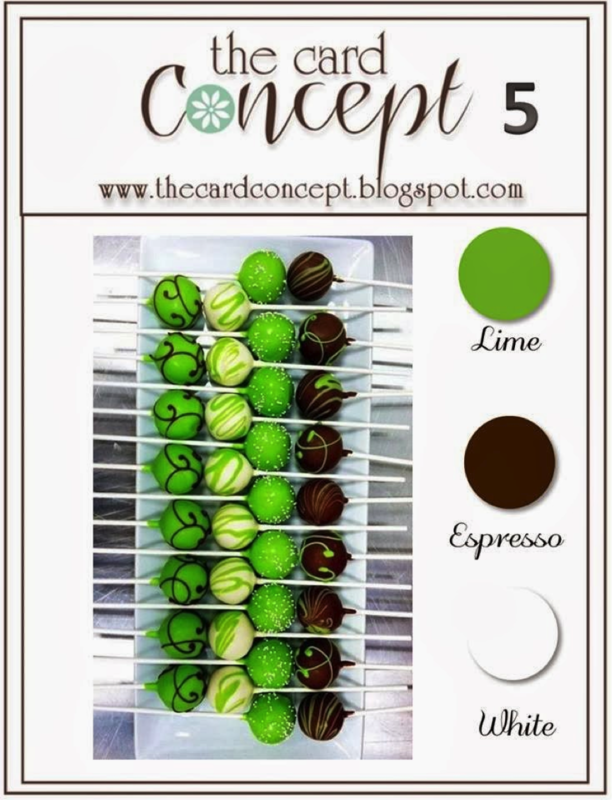 Come and join us with this challenge at The Card Concept – while you’re at the challenge, take a look at the gorgeous inspiration from the design team. I wish my “all I could come up with at the last minute” cards looked anywhere near as gorgeous as yours. It is stunning. I’m with Darnell….this card is absolutely gorgeous!!! I’m in awe of your ability to beautifully blend the elements of the card together so perfectly! Another fab card, Narelle – especially for a last minute card! Now you have to post the original version! Another gorgeous shabby card from you Narelle. I love the mix of shapes and the gorgeous distressed edges. The bow is fabulous. Lovely! Oh my you’ve done it again! This shabby chic creation is fabulous! Stunning card Narelle!! I just love your layering and the details…perfect!!! 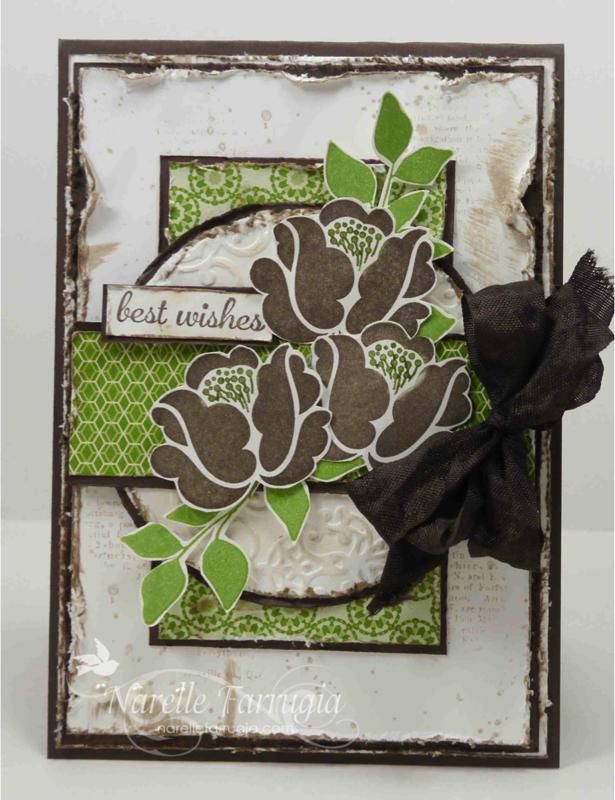 Those are yummy looking flowers Narelle…love the distressing on your card. I am always in awe of your cards and the great ways you “shabby” them up! So funny about your mistaking the chocolate color…it did look a lot like black at first glance! Love all of the distressing, the fabulous petals with gorgeous stamens and all of the layers and patterns…beautiful! It is amazing! Just like you! I could never whip up something so spectacular! Post your other card too!!! It was a beauty as well! LOL! I am sitting hearing laughing after reading Darnell’s comment! I am with her- no way no how could I come up with this card in an evening. Hours and hours…. This is gorgeous, Narelle; fab layout!